An old L.H.E. 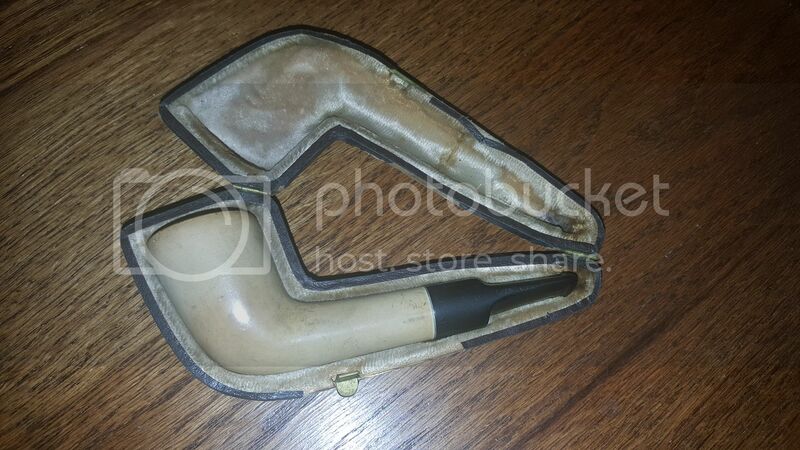 Yacht Shaped Meer with replacement Stem. Smoked Hard. 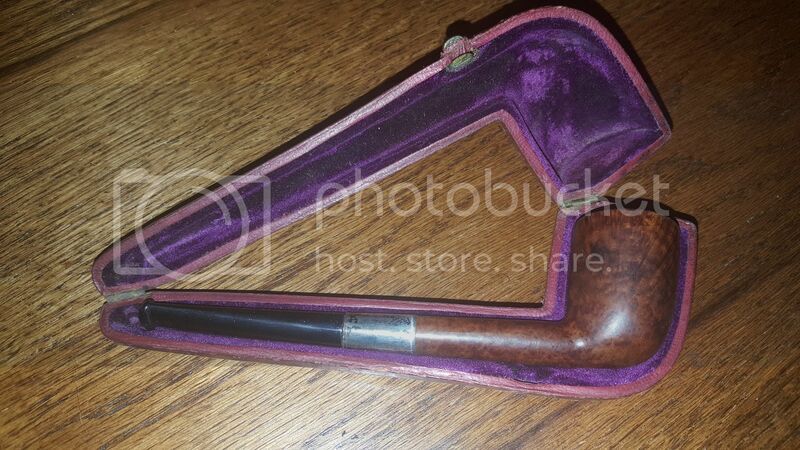 This is a very special Kaywoodie Meer for various reasons. 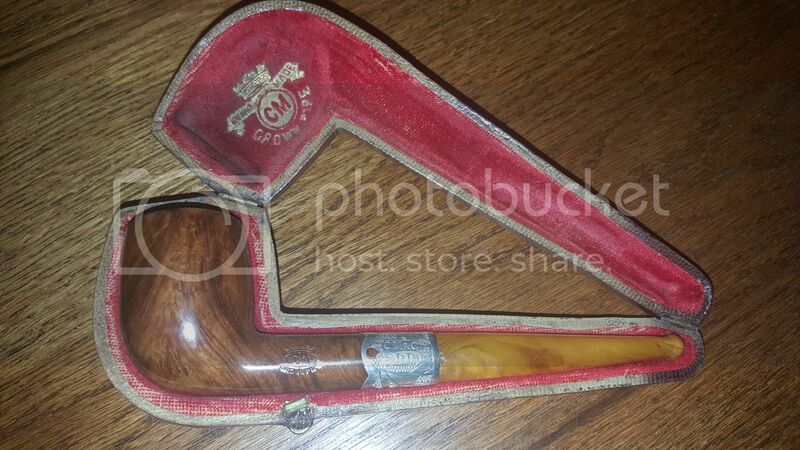 I purchased it from Mr. Can (the late, great Tony Soderman), its a 1938 Belge, the only year Kaywoodie offered that shape and it's my late father's birthyear. 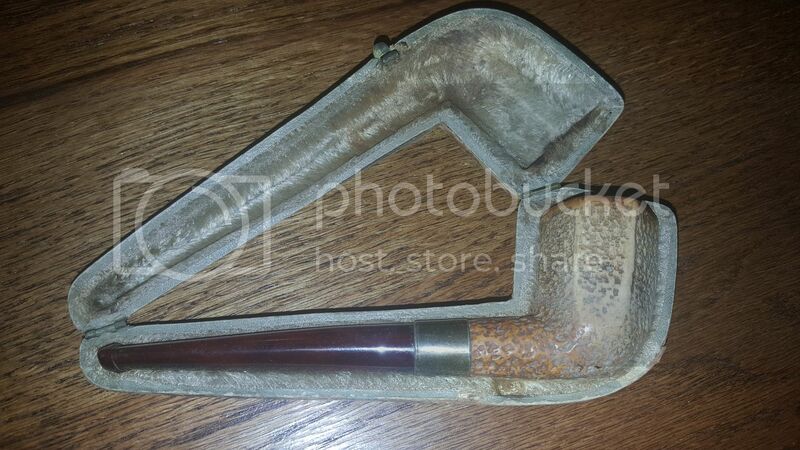 This is an 1888 Meer with Amber stem. It's the perfect size for plugs, bars, ropes and any other High Nic baccy. Kaywoodie Colt Meer from the 1950's. 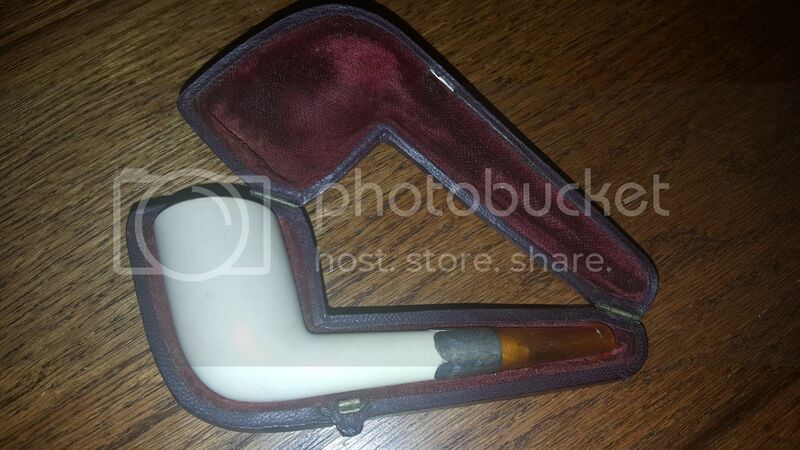 Great little pipe. 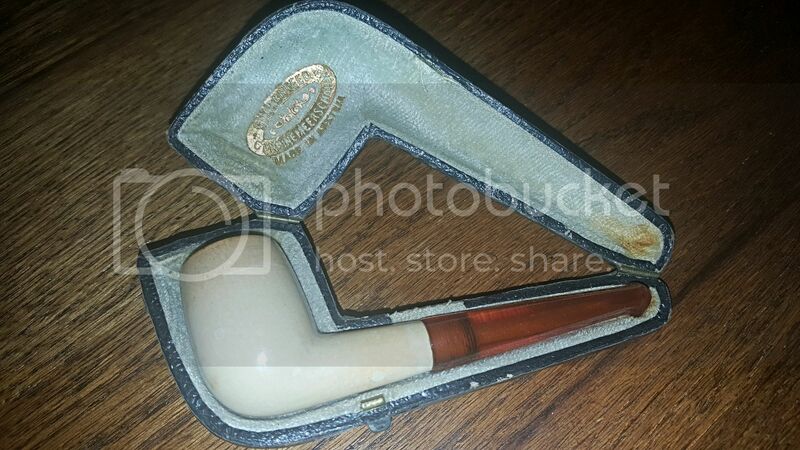 This is a great little pipe. It's like a Lego System of Nicotine Delivery. 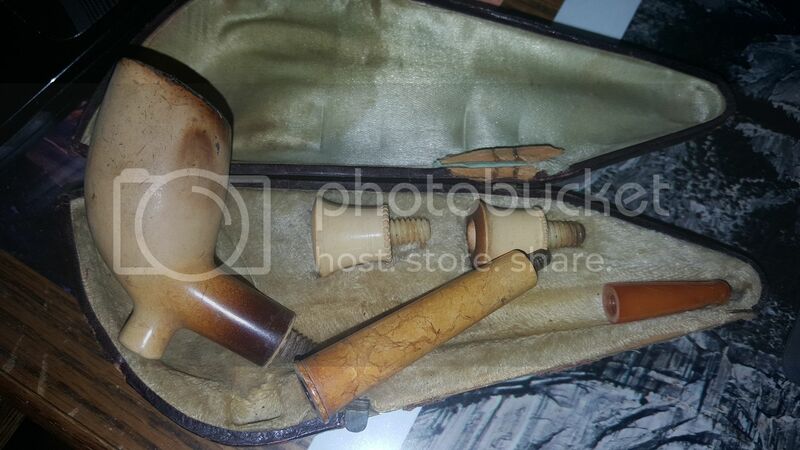 It's a Footed-Cutty, A Cheroot and a Cigarette holder all in one case. The shank appears to be Ivory and I've been told it's Ivory, but I'm doubtful. The whole thing assembles and disassembles. It's a great smoker too. The stem is Amber. Ooops.... I forgot to mention that the restored pipes were done so by our Dave G. He's a miracle worker. I especially like that 1898 C&M Crown! Very nice! What trophys, I feel like the History those pipes would tell would be a Michner tale. Your collection is very interesting ashdigger! (FWIW, both of our father's were born in 1938; mine turns 79 next monday jan 2!) 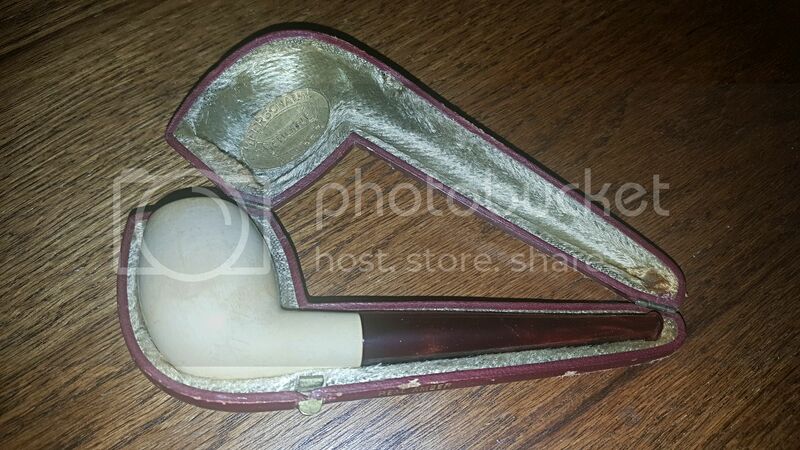 What I consider very cool is that you use your pipes for their intended function. 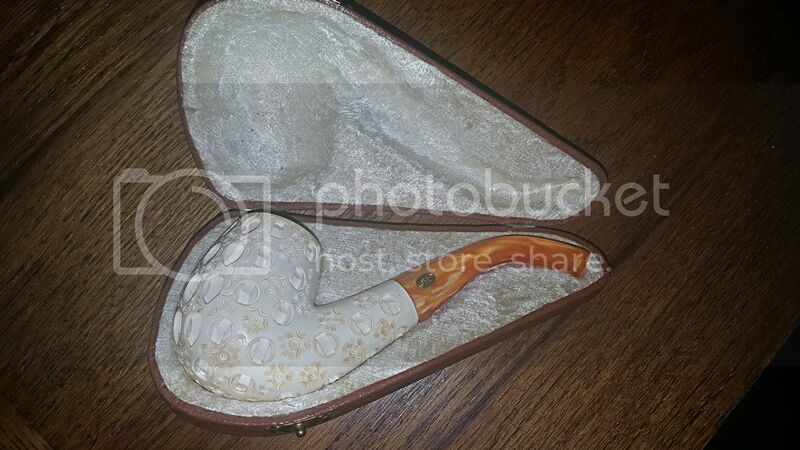 I lack the sentimental collector impulse to have a pipe for the sake of just having it. Nice collection! 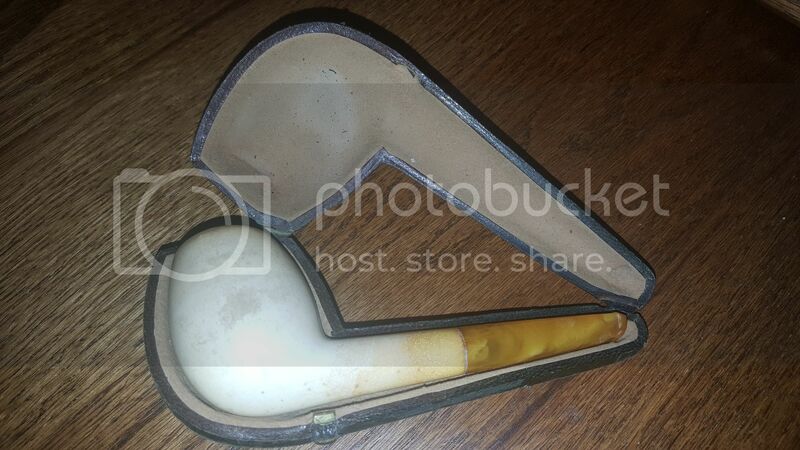 That oxblood meer, is it regular meerschaum that has been colored in some way? Alex, yes my understanding is that it's a standard meer that's colored. You have some beauties there. Wow , nice collection: I particularly like the bulldog and the horn. Do you smoke them all? After 100+ years some look like they were made yesterday. Bigbee, I smoke every one of them. I haven't had the Horn very long. It needed a new stem....it won't be that color next year. Very Very Nice! All beauties indeed. Well done! The collection and the photos. Great stuff. Ash, what an outstandingly splendidly magnificent collection! Thank you so much for posting! I am absolutely fascinated! That C&M Crown is my favorite, what a classy piece. That GBD looks familiar! Have you smoked it yet? I'm didnt' have anything to compare it to, but thought it smoked quite well, with a better than average stem (for a meer). You're right about the cases ... never thought about it but they really add an element of class and vintage appeal. That's a hell of a collection, Tim. Thanks gang. 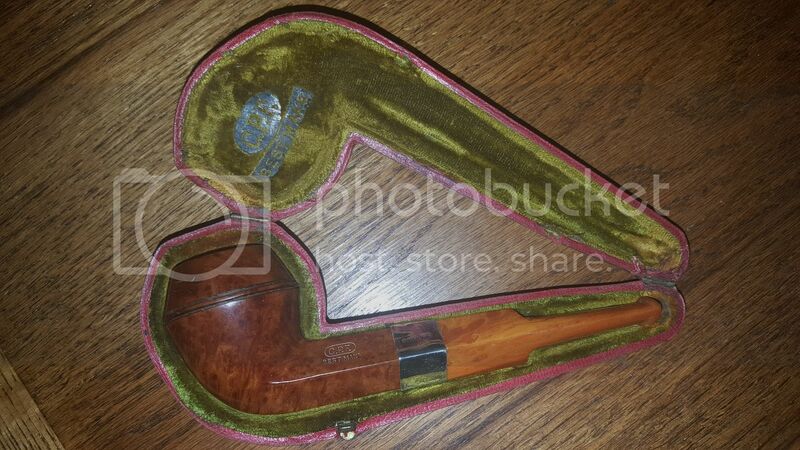 I really enjoy them......enough, that I'm going to throw some of my Brit-Wood up on eBay......for more cased pipes. 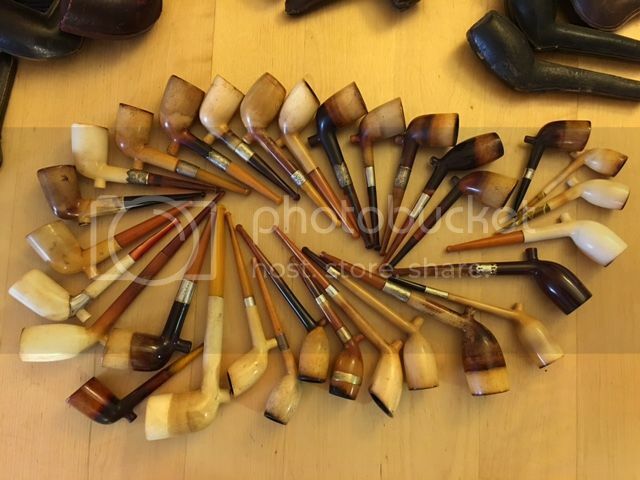 OK since its News Years Eve here are a few of my cased 'cutty' pipes which I am sure you have all seen before! Tip of the iceberg old boy and before anyone asks yes I smoke everyone of those plus many more but they all look depressingly the same!! I have even more of the damn things if you want to see more pipes that all look the same. I picked up some real super ones recently that I had re-stemmed by Rik at Briarville but my new years resolution is to slow down on buying these types of pipes as its getting ridiculous! 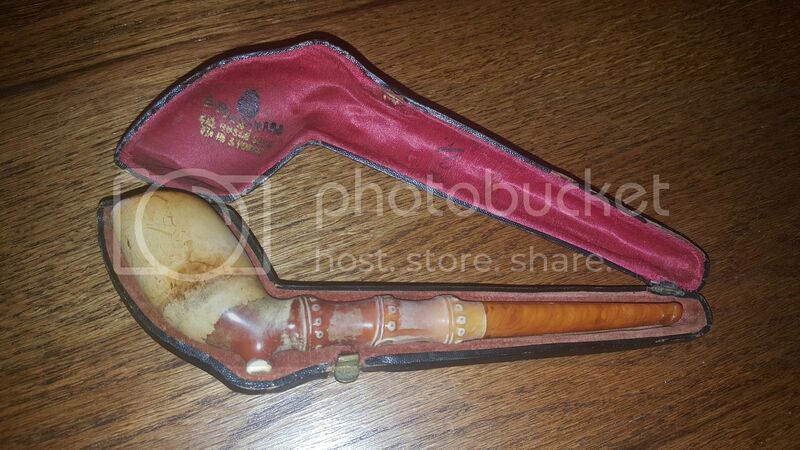 Ash, those are some rare, old and interesting looking pipes, I assume each of those pipes came with the fitted case shown (except as mentioned), but I wonder who makes them (the cases)? 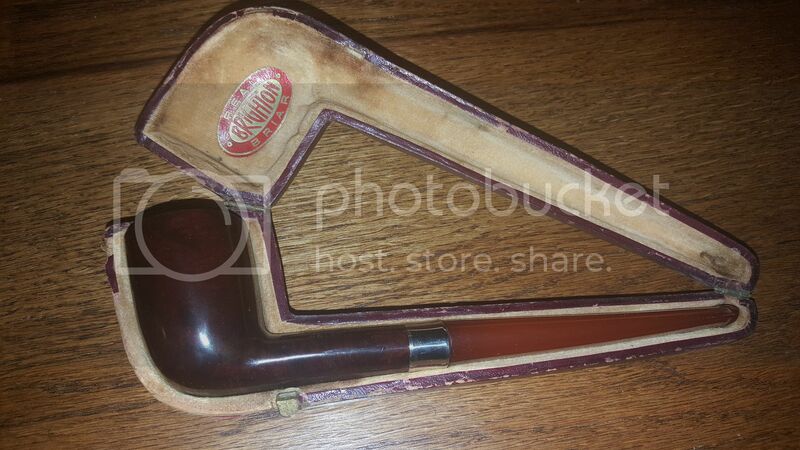 Is there anyone out there these days who can make a case like that for a pipe? That would be an interesting thing to try to learn to do. 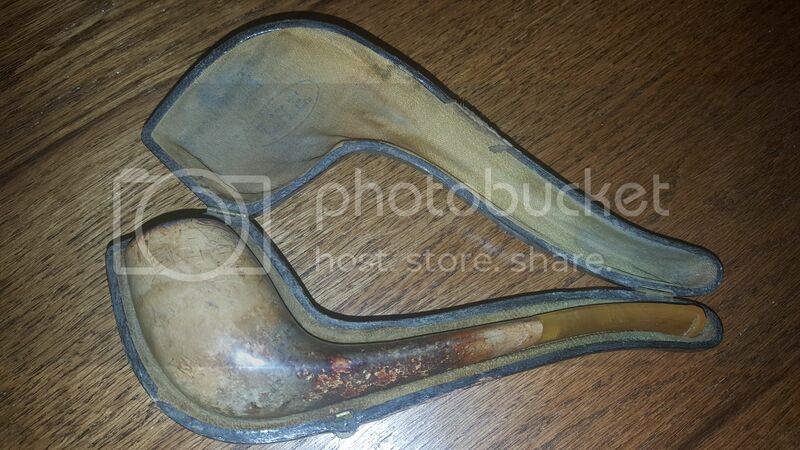 I would assume one takes a mold of some kind of the pipe, then cuts it in half, splits it, etc., then lines/upholsters it; would be interesting to read someone's write up who has experience in how they are done. Seeing them all in one shot ... very impressive. Great collection. They look like violins in their cases. 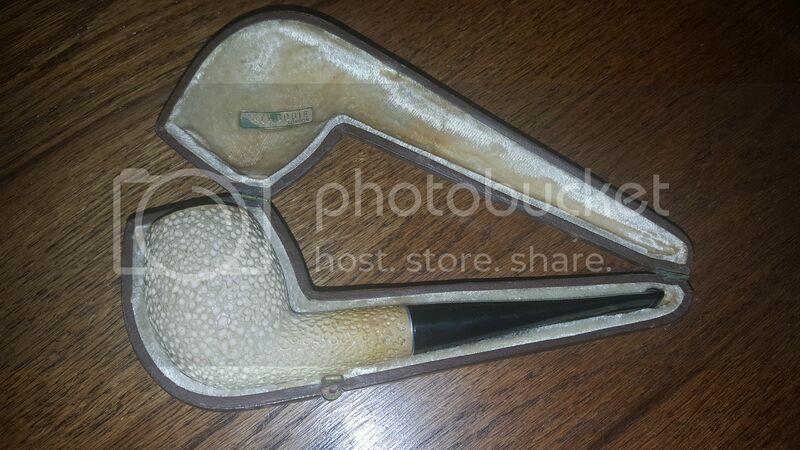 They have a definite upper class ring, but also suggest that for pipe smokers of modest means, good pipes were treasures to be cradled in luxury. 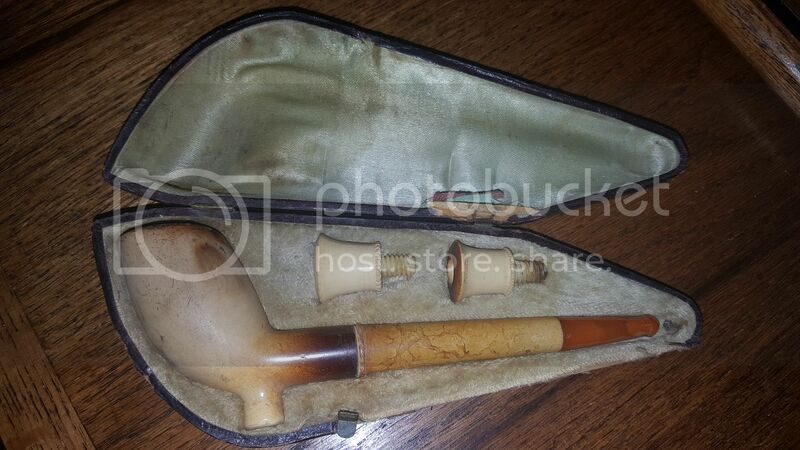 It adds to the ritual of a smoke to take down the case and lift the pipe from its velvet confines. Very nice collection. I've never seen the Colt in Meer, extra cool. I'm glad that they get smoked and don't just sit on a shelf. *twitches* Much vintage, so wow, classy !! Ashdigger, that's a mighty fine collection! I, too, love cased pipes. 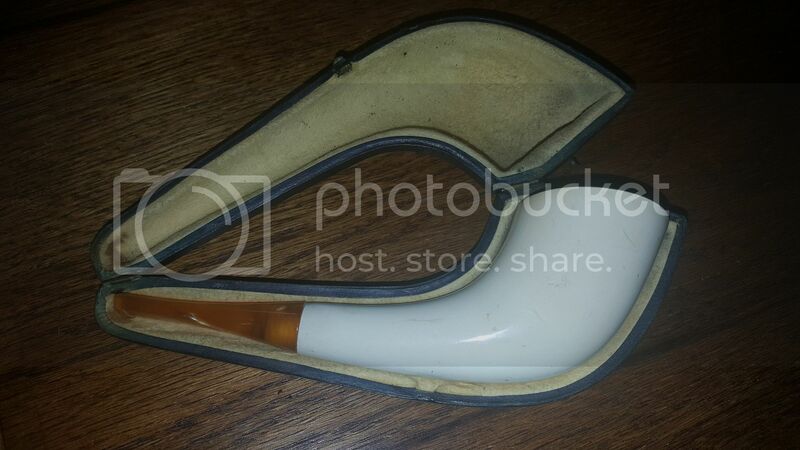 GBD seems to have been the first company to put a metal rondelle in stems of meerschaum pipes; only Golden Horn and CAO followed suit (not including SMS's internally-located stem logos).